At last I've completed by revised covers for the three stories in last year's Revisitations 2 boxset. 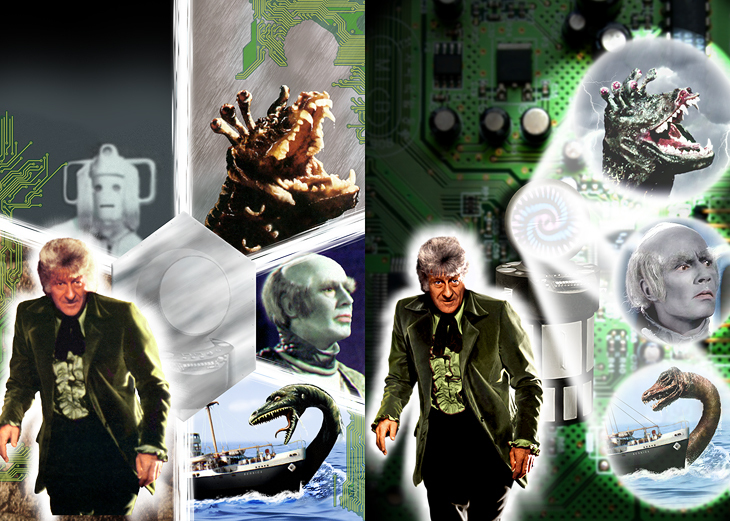 While 'The Seeds of Death' and 'Resurrection of the Daleks' had been fairly straightforward updates -- with no significant changes to the designs, just improvements to the execution -- I felt 'Carnival' warranted a more major facelift. As I've mentioned before, many of my early covers were limited by my inability to take screengrabs from the DVDs (either of images in the photo galleries or shots from the episodes themselves) owing to the Mac I had then not having a DVD drive (I know, kids, can you imagine?). This was sometimes particularly irksome when I was designing for stories that had few photos available, of which 'Carnival' was certainly one. There seem to be several shots of Vorg and Pletrac, a few of Major and Claire Daly, a couple of fuzzy Drashig close-ups and that's pretty much it. Not a lot to work with (as I think both official covers also demonstrate). Luckily there's one good photo of the Doctor from the story, in the cave on the Drashig's planet. For my original cover I had used a scan from DWM which was rather soft and my skills then at touching up were less developed. I don't think it was that long afterwards that I found a good-sized copy of the same shot on the BBC website, so a small revision of the cover was always on the cards. When 'Carnival' was announced as getting a revisitation on DVD I was glad for this opportunity, even though I wasn't convinced the DVD itself really needed redoing. When it came to it, the new image was quite blocky from JPEG compression so required more work than I'd expected, but the result is clearly sharper and more detailed than my original cover. I remember struggling for quite a while to devise a workable design when first doing a 'Carnival' cover. The limited photo options precluded any large 'scenic' composition so I pondered different ways of featuring several small images. One idea was to use a close-up of Vorg's jacket with a different character in each of the rings. I'm not sure that would have worked and fortunately I couldn't find a large enough photo of the coat. So in the end this became the first of my covers to use a device with which to split the illustration into regions, using the hexagonal shape of the access plates inside the Miniscope as a hub for six 'mini-scenes'. Well, five, as fortunately the Doctor took up two segments. I say fortunately because, for a story called 'Carnival of Monsters', there aren't actually that many monsters in it! There are the Drashigs, of course, the plesiosaur that attacks the SS Bernice, and then I began to struggle. The Inter Minorians were suitably villainous to warrant a slot, if not really monsters, but the only others we see are some fuzzy Ogrons and Cybermen. Not much of a carnival. I didn't want to include the latter two as they're barely in the show, but knowing the story title would cover one of my six segments, I was able to get away with a blurry Cyberman in the background. Even having found three 'monsters' for my remaining segments, my options were limited. At least I had a photo of a Drashig, if a little blurry, so he became my upper-most figure, enhanced with a rainy background, although I should have balanced his colour better so he wasn't so yellow. I wanted to use Kalik to represent the Inter Minorians but no photos existed (and no screengrabs, of course) so I had to use a very poor-focus shot of Pletrac. For the plesiosaur attacking the ship, I was pleased with the boat image I found and the waves I created around it. But without a photo of the creature itself (or not willing to use the rather ropey model) I resorted to nicking from Chris Achilleos's book jacket illustration -- something I tried to convince myself was a cute homage but very quickly regretted as little short of plagiarism, compounded by having to scan the Miniscope from the painting on the cover of the VHS release as the only way to include the machine. Finally my effects to separate the segments were pretty feeble, and the circuit tracing to suggest the nature of the Miniscope was never as effective as I'd hoped. All in all this was one of my most disappointing covers so one I was more than keen to revisit. Initially I hadn't planned to change the structure of the illustration, it being mainly the images themselves I was unhappy with. I thought I could use a screengrab of the Miniscope proper to replace the hexagonal plate in the centre, swap Pletrac for a grab of Kalik, redo the Drashig and plesiosaur (using the proper model shot this time) and, in place of the white radial beams, use the circuit lines to separate the elements. It was this last that made me think twice, however, as when I began to draw them it quickly became very dull and was clearly going to take ages. Now I'm not against putting in the effort for a worthwhile result, but this seemed a lot of work for a relatively unimportant aspect. However, the interior of the Miniscope does play a significant part in the story, so I liked the idea of representing that somehow. It was then I began to think that, with the Miniscope more prominent, I could have the 'scenes' being projected from its glowsphere. This left the entire background free to represent the interior of the machine, for which I could use a photo of some actual circuitry rather than trying to draw it from scratch. I found an image that included plenty of components rather than just circuit lines, to be a little closer to what's seen on screen (well, ish) and applied spotlights to where the Scope projections would sit. The Scope is an amalgam of several shots to produce a full-length image with a decent view of the controls and the sphere facing forwards. The Drashig is from a screengrab this time, as the photos were no better in quality and I felt this shot showed his features better. Kalik likewise, with his grey make-up touched up where I felt there was a bit too much pink skin showing through still. And finally the plesiosaur is as he appears in the show, with a new neck painted from scratch. This still pays homage to Achilleos's illustration without stealing his actual artwork.